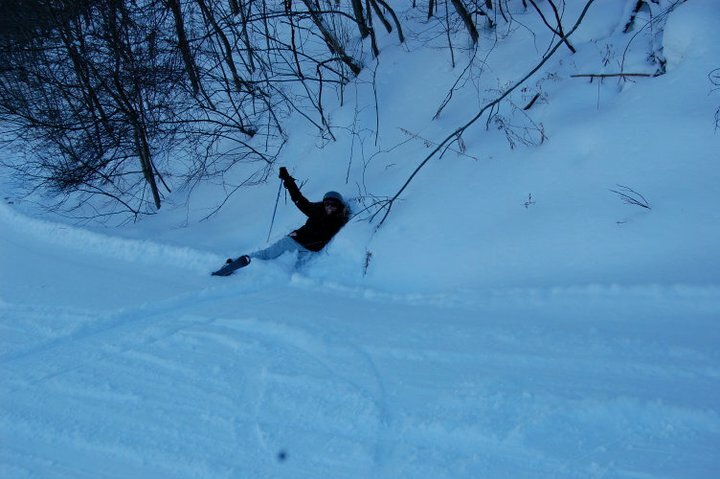 One of Doreen’s passions is being an adaptive ski coach at Greek Peak. She gave me the full experience – including a trip down the bunny slope in a mono-ski – when I tagged along with her in 2011. The weeks leading up to Christmas are always hectic, filled with last minute shopping and holiday gatherings. So why I thought it was the perfect time to plan a reunion of sorts for my Leadership Chenango Class of 2010 classmates, I’ll never know. With everyone’s schedules packed to the gills, it was nearly impossible to find a time that would work for even a meager majority. But finally a date and time were identified that might work. And it just might have worked, if not for Mother Nature’s untimely intervention. The heavy, wet snow was beautiful, but it made the roads rather treacherous. So much so that I wasn’t entirely surprised to find only one of my compatriots at our chosen venue (Uncorked Cafe & Lounge in Norwich, NY). I was glad to see that person was Doreen Rowe. Doreen and I had met as part of the community leadership program, and our paths had continued to cross professionally and through shared interests so often that we’d naturally grown into friends. It had been awhile since we’d had an opportunity to catch up. So, we had a glass of wine and did just that as we waited to see if anyone else intended to brave the weather. It was close to an hour before another member of our group, Roger Connelly, arrived. By then Doreen and I had worked our way through a number of topics, from the sudden turn my career had taken and some things that had been weighing heavily on my mind to her volunteer work as an adaptive ski coach, an upcoming ski trip she had booked and our respective holiday plans. Doreen left shortly after Roger arrived, anxious to get home to meet her daughter Amy, who was driving down from Albany. But our conversation stayed with me. The last couple of months have been a bit tumultuous, and our time together did me good. Talking to Doreen – even just being in her presence – always helps me put things in better perspective. I was still thinking about Doreen and reflecting on our conversation the next morning, when I received a message from a mutual friend. Doreen had suffered a major heart attack and was in very serious condition. The tears came instantly, as a jumble of thoughts and emotions hit me. She had been happy and laughing and her usual amazing self the night before and I just couldn’t wrap my head around the fact that this had happened so soon after I’d seen her. I was scared to death for Doreen and her family, fervently praying that she’d pull through, scrambling to think of any way I could be of help to her family, and feeling completely lost. There was one thought in particular that caused my heart to ache so badly it felt like it would burst: what if the time I had spent with Doreen the night before was the last time I would see her? If I’d known that was even a possibility, what would I have said? What would I have wanted her to know? Doreen is extremely intelligent and incredibly knowledgeable about her fields of expertise (of which she has many). She’s also one of the strongest, kindest, most caring and selfless people you will ever meet. But I didn’t realize that at first. Because Doreen is calm, cool, collected and incredibly modest.. where I, umm, skew to the emotionally impulsive and wear everything on my sleeve. So, you could saw we were a bit like oil and water when we first met. That all changed after Doreen came to one of our classes with a new haircut. I mean no offense when I say it wasn’t very flattering. It had an air of mullet about it, cut very close – almost shaved – on the sides with the top/back a tight perm. I am ashamed to say, I may have thrown her a few sideways glances when I first saw it. But then I learned WHY she’d done it. You see, a dear friend of Doreen’s was scheduled to have brain surgery. And one of the things causing her the most angst was what she’d look like after she had the operation. So Doreen went with her and had her hair cut, too. I went home and cried after that. I had clearly, almost criminally, misjudged this woman. Who was a better person than I. See, my father had recently started chemo. He too had been self conscious and anxious about loosing his hair. But it had never crossed my mind to do what Doreen had done. From that moment on, I paid more attention and had a bit of an epiphany. I realized that the differences I perceived between Doreen and myself came down mostly to communication styles. (And some startling immaturity on my part!) But once I got past that, I began to truly discover what an amazing person she is. We all have our own way of making a difference. 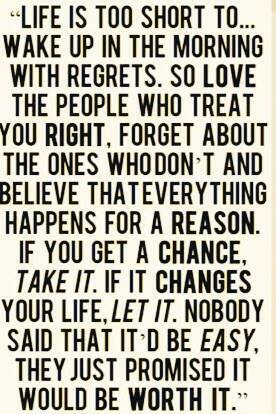 For me, that way has been through writing. But Doreen makes a difference by doing. 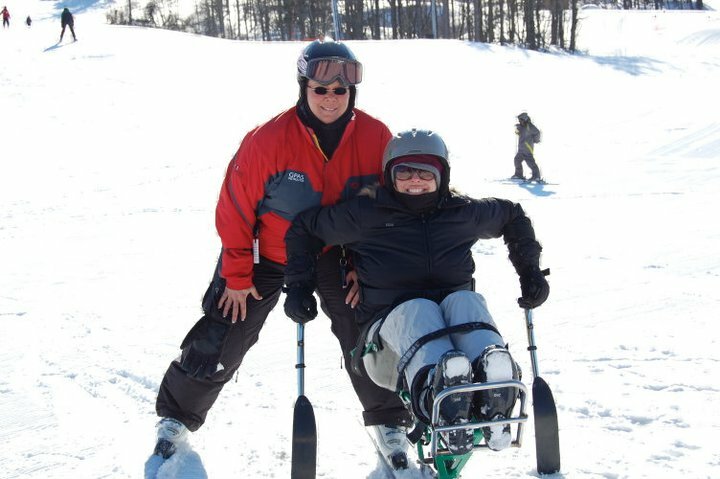 One of her greatest passions is volunteering as an adaptive ski coach, helping blind and physically disabled individuals learn to ski and snowboard at Greek Peak’s Adaptive Snowsports Center. I got to see her in action in 2011, when she invited me to do a story about the Winter Challenge she’s involved with. It also solidified my friendship with Doreen, something for which I will always be grateful. We’ve golfed together, skied together, laughed and cried. I’ve come to value her opinion and her insight on so many topics and issues, particularly those relating to education and agriculture. And one story she told me, about a piece of advise someone gave her early in her career, has been something I’ve gone back to on more than one occasion. Every time I see or talk to her, I am more amazed. There’s a reason my mother calls her Wonder Woman. She’s a one woman dynamo. And she pushes me to be a better person, simply because I want to be more like her. Although she has no way of knowing that, because I’ve never taken the time to tell her. Doreen, without realizing it, you’ve become an amazing influence on my life. You inspire me to put my heart into everything I do, and to be there for others. Your selfless acts and strength have touched so many lives, including my own. I cherish the time we’ve spent together, and I can’t wait to hit the golf course and the slopes with you again. You have never been far from my thoughts these last few weeks, and you and your family will remain in my prayers throughout your recovery. And thank you for teaching me yet another life lesson: how very important it is to let people know how much they mean to you. so sorry to hear this bad news, Doreen is one of a kind for sure, Get well soon…. Melissa, that was very beautiful.